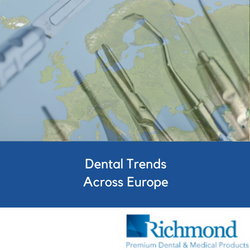 According to recent statistics courtesy of the European Union, the overall number of dentists practicing in the region has held firm at around 345,000, while pockets of central and eastern Europe have seen sharp increases in the number of practicing professionals. Eurostat, the statistical office of the EU, measures dentists per 100,000 inhabitants on a per country basis and has tracked figures through 2014. Lithuania saw a 30 percent increase in the number of practicing dentists, while Romania, Hungary, Italy, and Spain all saw increases of greater than 20 percent. Bulgaria also reached a double-digit increase at 13 percent. Greece maintains its status as having the highest number of dentists per 100,000 people, with 126, followed by Bulgaria and Cyprus at 98 and Estonia at 92. Bringing up the rear on the EU list are Slovakia, Malta, and Poland, with fewer than 50 practicing dentists per 100,000. In addition to the 345,000 dentists practicing in 2014, that year also saw 13,000 students graduate from EU dental schools. Germany led the EU in dental school graduates with 2,300. Other economies taking in more than 1000 graduates include France, Romania, Spain, and the United Kingdom. The European Federation of Periodontology (EFP), a non-profit umbrella organization of 30 national scientific societies of periodontology, has launched an awareness campaign to improve oral health. The initiative includes a new website to educate health professionals, researchers, policymakers and the public. With the new campaign, “Teeth are for a lifetime. Take action!”, the EFP is calling attention to the growing burden of dental caries and severe periodontal disease. In addition, the organization is building awareness of the simple and cost-effective preventative interventions available to address these conditions. Caries and periodontal disease are among the most common non-communicable diseases, while still largely preventable. These diseases can lead to tooth loss, severely affecting quality of life. More ominously, recent studies have linked periodontal disease to serious health issues such as diabetes, cardiovascular disease and even cancer. The 30 national societies that make up the EFP will promote the campaign in their countries, with actions targeted at local communities and authorities, including dental and other health professionals, researchers, the public and policymakers. Recommendations are based on the consensus of over 75 experts in the field of periodontology and cariology, from their analysis of existing scientific evidence during the 2016 EFP Perio Workshop. Founded in 1991, the EFP represents more than 14,000 periodontists and gingival health professionals from Europe, northern Africa and the Middle East. The EFP is the driving force behind EuroPerio, the world’s leading congress on periodontology. Visit www.perioandcaries.efp.org for up-to-date information and recommendations, including infographics and key messages, available for all stakeholders.